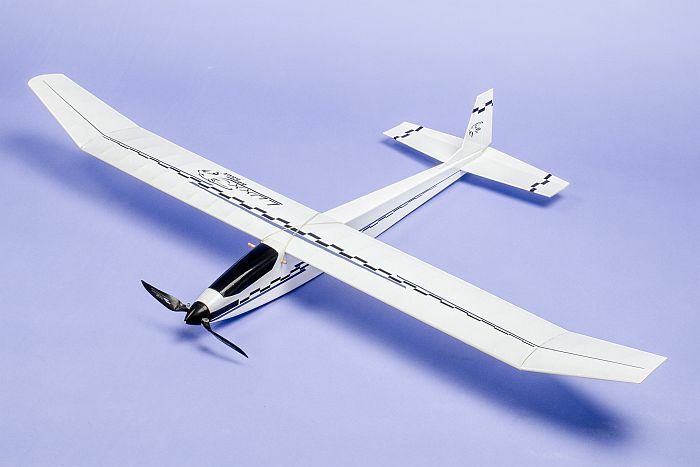 This small electric glider offers all the joy of building your own model. The Luxx is an agile model with good flying characteristics. It handles well in medium winds and can be used for thermal or slope soaring as well. The kit includes the required laser-cut parts, aero-naut wing jig, pine spars and hardware package. Step-by-step illustrated building instructions guarantee rapid success. The model is an all-wood construction with high-quality materials, the precision of laser-cut parts and detailed building instructions make the Luxx an attractive choice for those who want to experience the joy of real model building but don´t want to spend weeks building their model.The special aero-naut wing jig speeds up the building process and guarantees a true and accurate wing. The box-type fuselage and conventional wing design allow the model to be ready for the maiden flight after only a few building sessions. The canopy offers easy access to motor and battery, the wing can stay in place. The Luxx can be powered by small electric motors with an output of 100 - 150 W and 2-3s LiPos. To complete your model, you will also need: covering material, electric motor, folding prop and spinner, battery, R/C equipment.